Go here to read the comments. 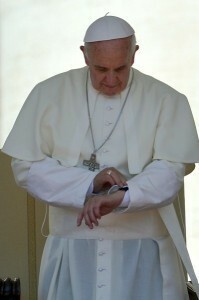 Any comment by PopeWatch would be superfluous. Were you there when they publicized the Pope? I’m trying my best to believe that man is primarily good. It’s many of his ideas and corresponding actions that are detestable. Ideas and actions can change. This conversion of heart and mind is helped or hampered by the body of believers..the Body of Christ. Prayers for conversions help. If I can change my ways, my ideas, my actions then by Gods grace anyone can be converted. If we Pray for Pope Francis 5 times more than we complain or belittle him maybe his conversion will be helped. I too must practice what I preach regarding all things for God’s glory. Jesus is providing us a task. Will we help him or hamper him?